In what looks like an apology or damage control video by Kuami Eugene concerning him saying he will not work with Pataapa because he makes too much noise in his music; well the ‘Wish Me Well’ hit maker in that video set the records straight. 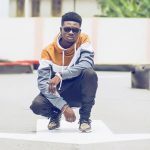 In a twitter video posted by the rock star, Kuami Eugene, he laments that what he said in the interview is not something new but actually that is how both artiste (him and Pataapa) tease each other. Kuami Eugene stressed that Ghanaians should wish him well as he wishes Pataapa well. Check out the video of Kuami Eugene apologising to fans and Pataapa. I had to do this to clear the air.